The Samsung ProXpress SL-M3320 is aimed at small offices looking for a professional and speedy machine that is cheap to operate. It is a great monochrome document printer with a user-friendly design and versatile paper handling, but it lacks some important features that growing offices may require. The simple yet universal design of this single-function printer makes it easy to set up and operate. It measures 14.4 x 14.4 x 10.3 inches and weighs 9.86Kg, so it needs a steady surface for installation. It runs on 128MB of memory while being powered by a 600MHz processor. There is a 250-sheet standard paper cassette and a single sheet manual feeder. Paper exits on a single-sheet face-up tray or a 150-sheet facedown tray. Connectivity is mainly through high-speed USB 2.0 and Ethernet, but an optional parallel interface can be installed. It can print in speeds of up to 33ppm on A4-sized sheets and 35ppm on letter-sized paper. 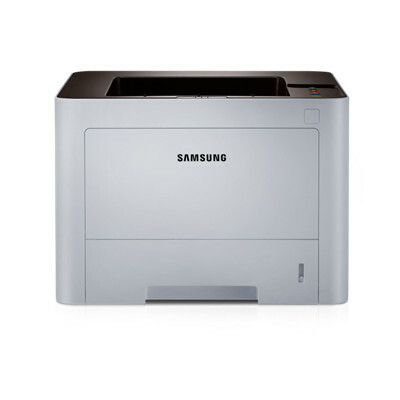 Eco Print is present, and users can configure the Samsung SL-M3320 to automatically print on both sides of the paper to save resources or to print barcodes. The 1200x1200dpi resolution produces crisp and sharp text, lines, and greyscale graphics. Media handling is versatile, as the Samsung SL-M3320 can print on transparencies, coloured paper, thick cardstock, labels, recycled paper, and cotton. The device is heavy and boxy. The maximum input capacity is only up to 771 sheets, which can be limiting for a growing office or a busier environment. Users need to buy an optional paper cassette if they wish to expand the paper capacity of the ProXpress SL-M3320. There are no options to expand the memory of the Samsung SL-M3320.